As of the time of this writing, the San Francisco Bay region is home to about 6.8 million people, ranking fifth among population centers in the United States. Most of these people live on the coastal lands along San Francisco Bay, the Sacramento River delta, and the Pacific coast. The region straddles the tectonic boundary between the Pacific and North American Plates and is crossed by several strands of the San Andreas Fault system. These faults, which are stressed by about 4 cm of relative plate motion each year, pose an obvious seismic hazard. We have many ways to study earthquake faults. Where faults break the land surface, we may learn valuable information needed for hazard assessment, such as cumulative offset, slip rate, and earthquake history. However, many of the major faults in the region are partly submerged beneath San Francisco and Monterey Bays. Although this situation poses problems in gathering observational data for hazard assessment, bay-region waterways provide an opportunity to study faultzone structure by using marine subsurface-imaging techniques, which are easier and cheaper than equivalent studies on land. In 1993, the U.S. Geological Survey (USGS) launched a 5-year project aimed at unearthing the basic science of the submerged San Andreas strike-slip fault system in the San Francisco Bay region with its many interacting strands. Primary project goals were structural, such as to discover how the San Andreas and Hayward Faults are connected or related at depth, to learn how the complex of faults in the San Andreas stepover zone on the Golden Gate platform functions, and to locate previously unknown faults. This volume thus contains mostly structural information about the San Francisco Bay region, much of it gathered through exploratory geophysical experiments. The volume is organized “top down,” from studies in the shallowest crust to the base of the crust. The first three chapters are linked through their use of novel geophysical techniques to study earthquake effects, coseismic slip, and shallow stratigraphy. Kayen and others examine crustal structure at very high resolution and demonstrate the use of ground-penetrating-radar tomography to measure the liquefaction potential of coastal sedimentary deposits. McGann and others use microfossils from drill cores along the San Francisco-Oakland Bay Bridge to determine a more detailed late Pleistocene stratigraphy of San Francisco Bay than was previously available. Geist and Zoback use the historical record of a small local tsunami generated by the great 1906 San Francisco earthquake to model the rupture process of that earthquake. The last four chapters are dedicated to studies of fault related structure of the seismogenic crust in and around the San Andreas Fault system in the San Francisco Bay region. Jachens and others compile an aeromagnetic anomaly map from new high-resolution flights across the bay region. Some of these anomalies mark the positions of offshore faults, and others are offset by faults, providing constraints on cumulative slip. Hart and others concisely summarize the marine seismic data recorded in and around San Francisco Bay, map the coverage, and provide archival information for those interested in acquiring data. The last two chapters present the results of the seismic data that have been analyzed. Bruns and others present their analysis of high-quality intermediate-resolution (~5-km penetration) seismic-reflection data gathered over the complex San Andreas-San Gregorio Fault junction. This junction, which is thought to be where the 1906 San Francisco earthquake originated (see Geist and Zoback, this volume), contains an apparent extensional right stepover in the San Andreas Fault. 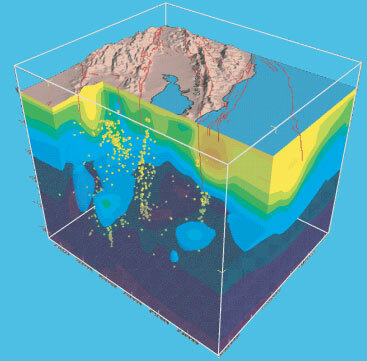 Finally, Parsons and others review and summarize the results of deep-crustal seismic-reflection experiments and local-earthquake tomographic studies, including previously unpublished data, and provide additional support and discussion for already-published studies. In summary, these studies were carried out in an environment where background information on faults in the San Francisco Bay region was sought. Much of the structural information presented here comes from experiments of a style unlikely to be conducted by the USGS in the near future. Together, the chapters in this volume provide a structural framework for a major part of a complex strike-slip fault system. Edited by Parsons, Tom, 2002, Crustal Structure of the Coastal and Marine San Francisco Bay Region, California: U.S. Geological Survey Professional Paper 1658, 145 pp., https://pubs.usgs.gov/pp/1658/.